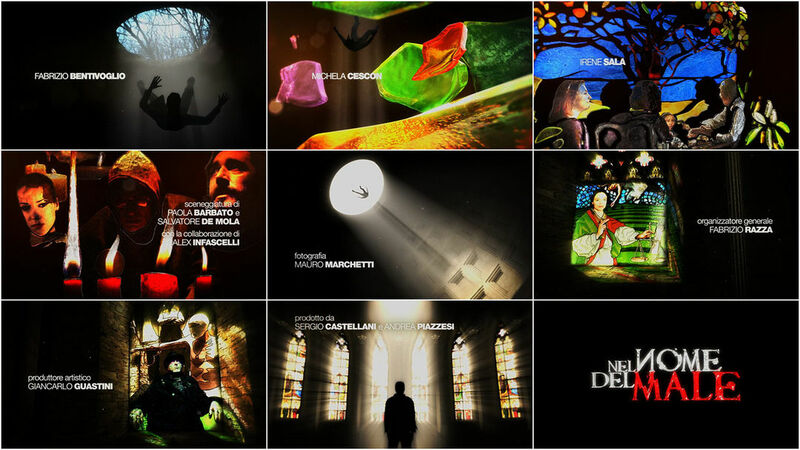 The operatic, intimate opening of SKY TV’s Nel Nome Del Male seems to breathe in the moans of ghosts, some inexorable damnation. The soft-shoe horrors found in the masterfully crafted elements of type and soundscape are striking. We did the sequence together with art director Marina Grandi and project manager Monica Masciocchi from FBF (Frame by Frame Italy). The miniseries, which aired in two episodes, recounts the story of a father who, upon the disappearance of his son, is forced to confront the terrible world of the seven deadly sins. We did some testing to see how good can we could make the 3D falling man and the stained glass movements. Everything needed to be HD so it took some serious research to create the macro shots of the stained glass. First we had an idea to shoot the falling man, but after talking it over with Marina and Monica we decided to make it 3D like the rest of the sequence. It took about 6 weeks to finish. The lead artist, Alexandras Polevojus, who also did the Boris 2 sequence, is one of the pioneers of 3D compositing in the Baltic States and one of a handful of pioneers of motion graphics after the Soviet Union collapse.